Using Protectionism to Reduce Protectionism? I’ve been very critical of Trump’s protectionism. I explained why he was wrong before the 2016 election and I’ve continued to argue he is misguided ever since he became President. Most recently, I even expressed hope that Congress would overturn his new taxes on American consumers. Some people are arguing, however, that the situation isn’t quite so bad because Trump may have a clever plan to use tariffs as a tool to force other nations to reduce their trade barriers. I very much hope that’s the case, as I noted in this interview with Fox Business, but I’m not holding my breath for a favorable outcome. I’m not the only one who is skeptical. In her column for the Wall Street Journal, Mary Anastasia O’Grady pours cold water on the hypothesis that Trump is playing a very clever game. President Trump’s practice of staking out extreme positions on trade as a negotiating tactic is a sign of his brilliance. Or so we’re told. But that theory took on water last week, when Mr. Trump had to backtrack on a promise to hit Mexico and Canada with a 25% tariff on steel and a 10% tariff on aluminum, without any concessions from either Mexico City or Ottawa. …Mr. “Art of the Deal” figured out that his opening tariff bid was on track to blow up the two best foreign markets for American-made steel and significant markets for American-made aluminum. It’s a good bet that the same producers who are lobbying for protection asked the president to back off the neighbors. The gaffe exposes the Trump administration’s failure to grasp the complexity of the supply chains that interconnect the global economy. By the way, I’m not just picking on Trump. I’ve criticized other Presidents for protectionist policies, most notably Hoover. And I even dinged Saint Ronald for trade barriers (though I also noted Reagan’s good policies regarding NAFTA and the GATT). Unsurprisingly George W. Bush also belongs on the list. Professor Vernon Smith relates a story about Bush’s protectionism in the Wall Street Journal. Professor Smith points out, however, that Bush was wrong on the politics as well as the economics (a lesson the GOP should have learned from Reagan). His proposal collided with a widespread political backlash at home and abroad, and with retaliation from our foreign trading partners. The Bush steel tariff, imposed in 2002, was rescinded in 2003. It was not feasible. He recognized its unreality, and backed off. Hopefully Trump will retreat as well. The last thing the world needs is a repeat of the 1930s. But if that happens, be prepared for very bad news. Here’s a report on how trade taxes would undermine America’s economy. A full-blown trade war would erase any economic benefits from the Republican tax cuts passed last year, according to an analysis by the University of Pennsylvania. …The Penn Wharton Budget Model, a research center at the university, imagined the worst case — no US imports or exports crossing borders tariff-free. The United States has free trade agreements with 20 nations. Wharton’s model assumes those all disappear. Such a trade war would make US economic output 0.9% lower than otherwise by 2027, according to the analysis. …Over the longer term, the costs of a trade war would heavily outweigh the benefits of the tax cut. By 2040, the US would lose 5.3% of economic output in the worst trade-war scenario, compared with a 1.6% increase from the tax cuts, the university found. Put another way, a full-blown trade war would cost the economy $200 billion over 10 years, and $1.4 trillion by 2040. American wages would decline, too, falling 1.1% over the next 10 years. Last but not least, Mark Perry recently shared three videos from Khan Academy on international trade and economics. All of them are worth watching if you really want to understand the issue. But here’s the one that I think everyone should watch. 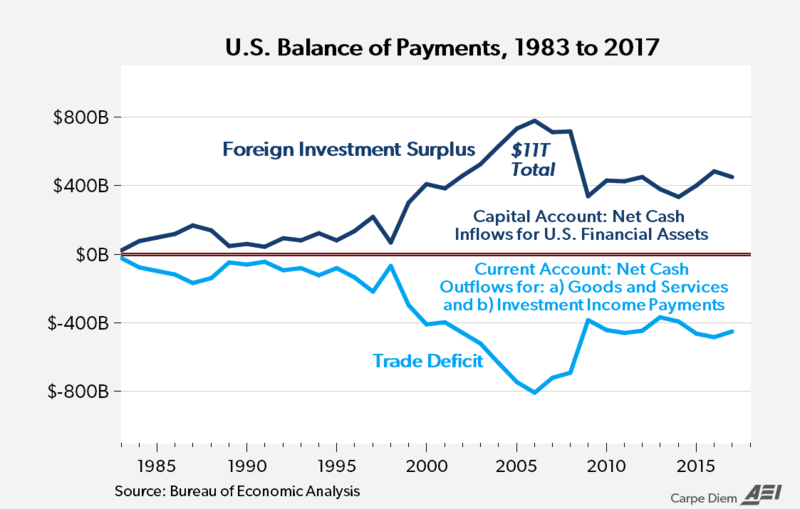 And Mark adds this chart, which reinforces the point from the video – and something I’ve also tried to explain – about a capital surplus being the necessary and automatic flip side of a trade deficit. In other words, when foreigners get dollars, they oftentimes think the best use of that money is to invest in America’s future. That’s a sign of strength, not weakness. P.S. If you think protectionism is a good idea, please review these five charts. P.P.S. Though I’m willing to go back to 19th-century tariffs – assuming we roll back all the government that has accumulated since then. It is not just about protectionism, it is also about national security. If we fail to produce things needed in war we become weaker as a nation. We need to make steel, and today’s military equipment is very dependent on electronics. If we import that from China, how do we confront China’s aggression? Instead we send our money to China fueling their technology and military build up. Dan, one problem with your capital account argument is that it ignores the grim reality that we are the ones who’ll end up in debt or selling off assets to fund our over-consumption, while foreigners will own the capital. I wonder Dan if you could list Nobel Laureates who have supported unilateral free trade, and those who have opposed the concept, in the event of one country imposing tariffs on another. I ask because Cecilia Malmstrom, the EU Trade Commisioner, is considering retaliatory action on Trump’s tariffs. These might include tariffs on iconic products of the United States such as Levi Jeans, Harley Davidson bikes and bourbon coming into the European Union. If the EU has any value at all, then one of them should be that the remoteness from the voter means the Commissioners should be able to take the soundest or most technocratic decision, free from the influence of the baying demos, and that decision should surely be to take no retaliatory action at all. I know Milton Friedman effectively endorsed the non-retaliation or unilateral free trade option as best at the end of this clip ( https://www.youtube.com/watch?v=lSdZXYk3zKI ), but I’m wondering what the majority of Nobel winners think. It’s not your specialist subject, but I’m just curious. It is always a dangerous gamble to compromise sound principle for strategic tactical moves. Having said that, part of me wants to fantasize that the likely international tension over tariffs could make humanity move further away from the consensus needed for a world run by Orwellian global government, the G8, G20, Gxx, Davos men (and women), the IMF, Eurocrats, climate treaties, the UN, tax cartels, and other international coercively collectivist big government bureaucracies. After all, experience shows that tariffs are easier to reverse, by a future administration or congress. By contrast, history shows that statism, and by extension global statism, is much harder to reverse. Watch the travails of the UK leaving the EU and the vindictiveness of the big government cartel, whose pathetic growth trendline amounts to deterministic decline. The tax cuts will have a modest overall statistical effect when the danger of a government debt crisis is factored in — simply because the tax cuts are not backed by a reduction in government spending. So if indeed all a trade war would do is negate the modest benefits of the tax cuts (I doubt the effect will be that small) then this may be a reasonable compromise if it’s going to slow down, halt — or even reverse — the slide towards global rule by statist elite. I remain though an opponent of the tariffs based on my initial caveat: It is always a dangerous gamble to compromise sound principle for strategic tactical moves — even assuming that they are indeed tactical moves; a big if.